Photograph: Ryan Adams. 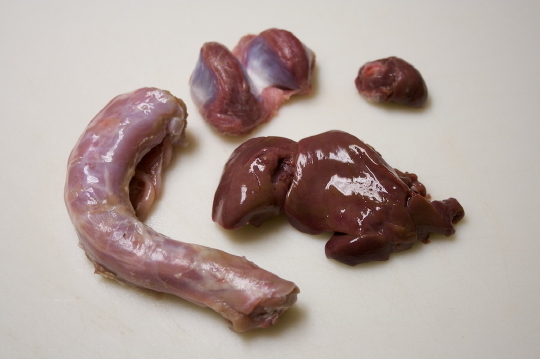 Clockwise from left: neck, gizzards, heart, and liver. If it's Friday, it must be Offal of the Week! Brought to you by Ryan Adams, author of the blog Nose to Tail at Home, each week we highlight a different part of the animal that you've always wanted to work with, but were afraid to ask your butcher for. This week: Turkey offal. Ah, Thanksgiving. 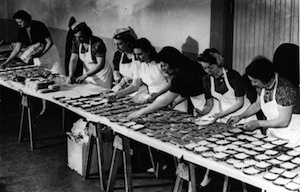 A time for over-eating, re-igniting family feuds, girding your psyche for Black Friday — and trying to wrap our brains around the jiggly, pre-baggied bits that come helpfully inserted inside the turkey cavity. It doesn't have to all be so hard! With my help you'll be able to identify all of those assorted giblets and find a good use for them and the turkey neck that you've been throwing away year after year. Here's a quick identification chart of the turkey offal you'll find either in the turkey's cavity, or the neck area covered by a flap of turkey skin. The long slender item on the far left is the turkey's neck. Consisting of mostly bones and tough muscle, the neck is actually a very flavorful piece of meat. Consider pan searing it until it's brown on all sides, and adding it to your gravy if you finish it early in the day. Keep your gravy on a low heat, adding water or chicken stock to keep the consistency that you prefer. The browned neck will continue cooking in the gravy, but it will also impart a lovely turkey flavor to it. Make sure to double-check your seasoning before you serve the gravy. At 6 o'clock you'll find the turkey's liver. I know, I know - you hate liver. But there is a trick to help make it more palatable. Hank Shaw, the James Beard nominated webmaster of Hunter Angler Gardner Cook, recommends letting your livers soak for a while in milk. This helps remove any traces of leftover blood and tempers the strong flavor. Consider dunking your turkey liver in a glass of milk while the bird roasts. After a few hours remove the liver, and rinse it clean under cold water. Lightly boiled or pan fried, you can then finely dice the liver and add it to stuffing or gravy for extra texture and flavor. 3 o'clock holds a turkey heart. Heart has a firm yet giving texture after cooking, with a very condensed meaty flavor that is exactly like that of the animal it came from. This is a perfect chance to impress everyone with that expensive meat-grinder attachment you bought for your Kitchenaide mixer (it's okay, I do it too). Once you have some finely ground turkey heart you can add it to pretty much any savory dish for a subtle turkey flavor boost. Or, brown the ground heart in a pan and use it as a meaty garnish. Way up at 12 is the turkey's gizzard. In birds, the gizzard is a dense muscle located at the top of the stomach that is used to pulverize food as a replacement for teeth. The constant use of the muscle makes it lean and tough, So that means long slow cooking times. I realize that whipping out the pressure cooker for a lone gizzard is foolish, so here's what I suggest: pan sear the gizzard all over, then add it to any stock you have sitting on the stove. It's not the most inventive idea, but when you're dealing with holiday insanity all day long, this is a quick and easy way to add a little extra flavor to your stock based dishes. Of course, many people like to just boil the contents of the bag and the neck and make gravy with them, and that's fine. My family does so every year and I truly enjoy the results each time. Here are a few more ideas for your turkey offal, and I wish you a happy holiday! The liver trick (soaking in milk) will work for beef/calf liver as well. It was told to my mother in the 1960s by her local butcher. The difference between milk-soaked and non-milk-soaked can definitely be tasted. And if you're not up to all of that, just feed it to your cat and let him or her enjoy Thanksgiving too! Hahahaha, that's an excellent point Joanne!